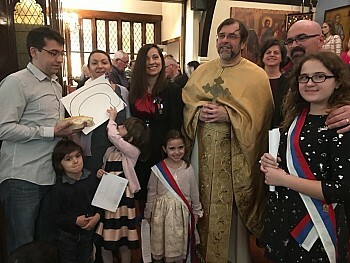 On Sunday January 28, St. Nicholas Serbian Orthodox in Elkins Park (Philadelphia) PA. celebrated it’s church-school Krsna Slava of St. Sava, first Archbishop of the Serbian and Costal Lands and Enlighener of the Serbians. Following Divine Liturgy, the Slavski Kolach and Koljivo were blessed in church, with all the children participating. Kumovi for the Krsna Slava were the Jovanovic family: Milan, Nevana, with their children, Jana and Danica. It was a special blessing to have Nevana‘s parents here, from Serbia, to see the children perform in the program. The community of St. Nicholas in Philadelphia extends its deepest gratitude to the Jovanovic family for being the patrons of the Krsna Slava dinner, and for the children’s gifts. Over 60 children of all ages participated in the celebration and program. In addition to their recitations the children, as s group, opened the program with the singing of “The Lord’s Prayer”, “The Star Spangled Banner” and “Boze Pravde”. They continued with the song, “Da Mi Ce Obeca…”. As well as recitations, the songs “Ko Udara Tako Pozno…” and “Sveti Savo Mudra Glavo…” were performed. 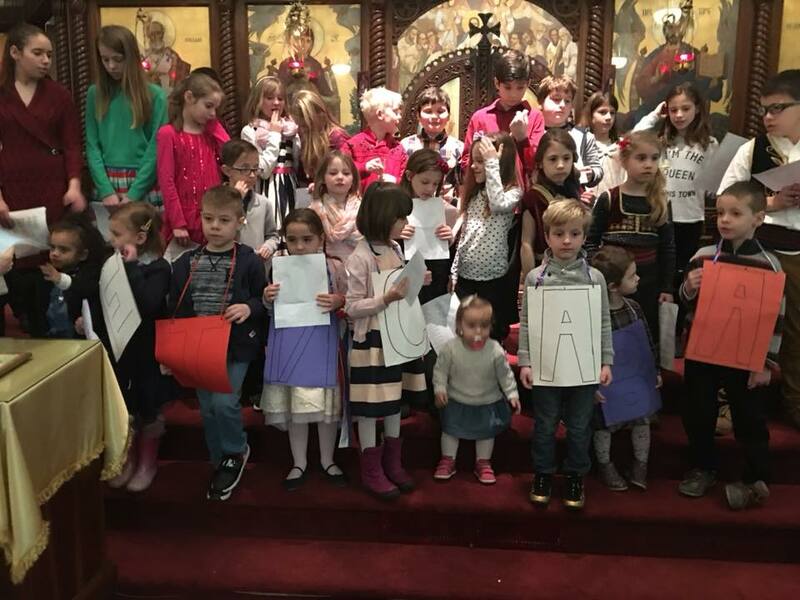 The program concluded with the Hymn of St. Sava, “Uskliknimo…” and all the children energetically wishing all who were present “Srecna Slava Sveti Sava”! Gifts for the children, which also included a screen printed t-shirt of St. Sava blessing the children, were distributed by the church-school teachers and Kumovi . All then proceeded to the hall for a delicious home cooked traditional Serbian dinner. Congratulations and “Many Years” to our next year’s Slava kumovi, Alexander and Ruzica, and their children, Nora and Nole.